April Gold’s tortuous slog toward an ‘easy’ rally target at 1332.00 warrants a closer look at the bearish case. 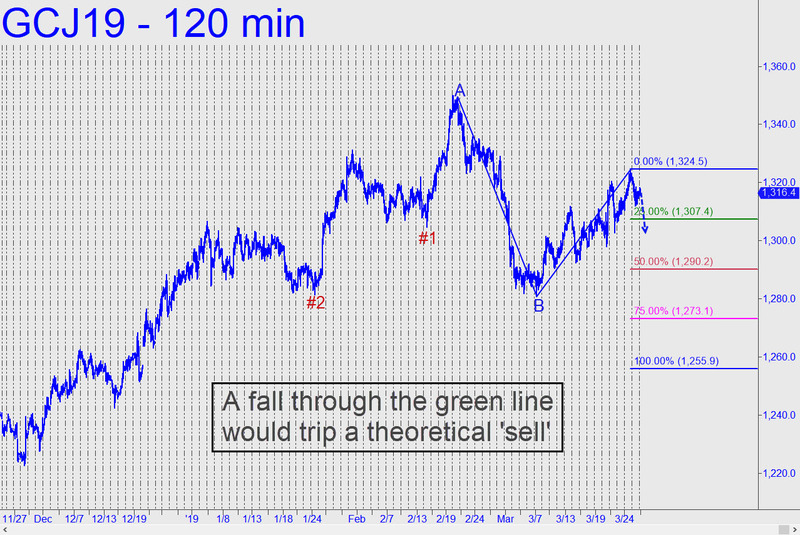 For if the futures were to fall just $9 to the green line at 1307.40 shown in the chart (click on inset), that would trip a theoretical sell signal to as low as 1255.90 — a 4.5% plunge from current levels. Although the bull trend begun last August from 1182 still dominates the daily chart, the A-B countertrend in the chart is sufficiently compelling to imply that a sharp correction may be imminent. The danger would be averted by a rally exceeding 1356. 80, where a small but technically significant peak was notched on the way down from 1400 last spring. (Note: The corresponding numbers for the June contract are: 1313.80 for the short trigger, and a 1262.70 target. The midpoint support lies at 1296.80 for the June, and 1290.20 for the April.) _______ UPDATE (Mar 27, 9:57 p.m.): The short triggered by a hair, opening a path down to — for starters — p=1296.80, basis the June contract (30-min, A=1355.60 on 2/20). _______ UPDATE (Mar 28, 9:08 p.m.): The Junes fell hard to 1296.00 in the opening hour, slightly exceeding our target. Bulls struggled to hold this Hidden Pivot support for the rest of the day, but the dip to 1293.3o is probably sufficient to put 1279.70, the ‘secondary pivot’, in play as a minimum downside objective. If it fails, look for more slippage to a worst-case 1262.70 as originally forecast.